Yet here’s what He says, the One who rules and reigns?over the affairs of all the nations of the earth! I mount as you stagger to realize an independent stand? Giant of Africa, continent of the Nile, darkened only by hectares of your unmined wealth; wallow not in regret! Soul of Nigeria —-my magnificent masterpiece—-awake in hope put on your strength be not beset! The ones revealed belong to us and to our children forever? By buying him a magnificent hat huh..
Like she forgot he flies upside down!? But this anthem speaks of regency, nobility, matchless royalty? (Too to o ye ki ediye funfun mo’re l’agba ennn yooo)? The blood crusted finger nails of the village kid? Betray the unvanquished army of thirsty head lice? Promenading beneath his profusely pomaded kinks? Why ceremoniously caress crisis that calls for the cross?? Why vials of virgin oil for hemorrhage needing virtue in the virgin’s Seed? The veins of wild beasts, bulls, goats, heifers go into sudden spasm? For we are imputed with His Son’s righteousness? Yet the great Emi Mimo must help us walk to the finish righteously? Roast regret, stewed skeptic, vexed with vegetables in a cursed calabash? Who dares tell his descendants water has no foe?? “Arise, he says, “shine for your illumination is here!”? Hearken with unwaxed ears; look with salved eyes—The Revelation!? Time fades into oblivion, life swallows up death! Interminable dawn interrupts intermittent night! The carcass, the corpse of darkness alone remains—- (oku okunkun lo kuku ku!)? With enlightened zeal, come strum your harp! Dominate the planet! It is the culmination of all things, the hushing, the hushing of creation’s wail,?The manifestation of the King’s sons. Eyin ara,?There is a place where the hot and cold springs of Ikogosi embrace? Under the shadow of Eledumare , Arinu r’ode, Olumoran okan? Jumi who holds qualifications in Dental Surgery and Medical Informatics is the Creative Enthusiast behind IMOLE, Jumi’s Spoken Cabaret is an innovative compilation of ten inspirational tracks of ironic weaves of recitals, songs, poetry, word games, wit, metaphors and subtleties set to varying genres of music. Jumi sees poetry as a fascinating tool that gives expression to a passionate and unorthodox voice. She clearly feels very much a part of her audience and believes that in listening incisively they will find twists, turns and whimsies of our collective destiny food for inspired thought. A “proudly Nigerian” poet, vocalist and lyricist with a tender tough stripe of cultural louche and spiritual commentary, Jumi’s artistic style is bold and imaginative with a conversational voice that sounds almost reticent. 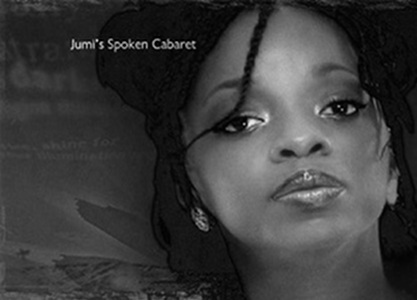 In Jumi’s Spoken Cabaret, she maximizes this compelling and inimitable style to ride hot currents for the pain and pleasure of swooping around spiritual, pure, social, maternal and fragile subjects. Whilst doing this, she clings to images of reality that are firmly embedded in what she perceives to be the public’s consciousness, acknowledging issues people feel they are familiar with or can relate to, offering a speculative but entirely plausible view. Exposure to Yoruba griot sounds, classical forms of music plus a need for and hunger to express truth’s tale becomes tension released in distinct ways in each of the ten tracks on the CD. From deep sentiments to an indigenous groove set to a lush vocal background to epics of gratitude carrying a sensual earthiness, the entire production is a consolidation of international and traditional styles fused into a deeply personal approach. Jumi is happily married to her friend Kola and has three daugthers.